US Secretary of State Hillary Clinton visited India from May 7-9 as part of a larger Asia swing with an itinerary encompassing China and Bangladesh. Coincidentally or not, Indian Finance Minister Pranab Mukherjee was on hand in Dhaka during Clinton’s two-day stopover in Bangladesh, the first by a sitting US Secretary of State since the arrival of Colin Powell in 2003. This came right after her nearly week-long visit with China, where most headlines focused on the controversial high-level negotiations over the fate of blind human rights activist Chen Guangcheng. India is tracking its economic indicators anxiously like everyone else, hoping that its stellar growth of late does not stall drastically as many are forecasting amid an uncertain global system and an ocean of red tape, cronyism, and corruption plaguing all levels of society. Indians are generally unhappy with the ruling government and just as bored by the alternatives. Iran Oil Sanctions. The United States and India are used to the game of delicate dance steps and flirtations around a third party. US administrations over many decades have managed to keep both India and Pakistan as allies despite the deep jealousy and resentment this has caused most of the time. Similarly, India is trying to strike the balance between the United States and Israel on one hand and Iran on the other. India has managed to keep up alliances with all, true to its non-aligned pedigree. The leading point of contention, and easily the largest thorn in current US-India relations is the amount of oil India imports from Iran. With great effort the Obama administration has gotten most of the world’s major powers to restrict imports of Iranian oil in an effort to punish Iran on nuclear issues, and India is among the laggards- and the second-largest importer of Iranian oil for some time. Recent carefully timed announcements have been made about reductions of imports by key Indian refineries, but Clinton asked for more during her trip. She did acknowledge that India has made progress. Continued cooperation from India will be an uphill battle based on India’s growing thirst for energy and strong internal political opposition on the grounds of sovereignty, solidarity with Iran, trade ties, and even some anti-US sentiment. The threat of UN backed sanctions and additional supplementary sanctions against India is a viable stick the United States can wield, and one that is being brandished toward other nations. These would potentially hurt Indian firms’ access to the United States market just as economic growth is foremost on everyone’s minds. But it’s not likely to happen. Manmohan Singh and his people, for their part, attempted to buy time and patience on the Iran question. Foreign Minister Krishnan went as far as to say Iran is not a source of discord in relations. In other words, there was a restatement of positions and no apparent breakthrough, though with a show of good faith from both sides. The Iran issue will drag on at least until June when the two nations will hold a wider high-level strategic dialogue, till which time we expect multiple issues to be tabled. Progress has been slow and incremental. Tensions seem to be easing and at some point there should be an equilibrium achieved at a level of oil imports acceptable to both parties. Expect US pressure to continue till then- along with assistance on finding other supply sources. The alternative more damaging than sanctions is one that India certainly does not want and America probably does not want: a war with Iran that disrupts global energy supply. Mamata Banerjee (Didi) as Power Broker and the Rise of Local Government in Foreign Policy. We find it fascinating that a visiting Secretary of State would see a particular state’s Chief Minister, that too even before meeting the New Delhi honchos during a time of many agenda items on the bilateral plate. This displays a recognition of the diminutive Didi’s influence on the nation’s affairs and her effect on coalition politics, an acknowledgement of the primacy of a foreign local government in America’s interests, and the sheer size of the economic growth potential and population of West Bengal to pique that interest. America also rewarded and congratulated a state and a politician who overcame communist rivals as evidenced by Clinton’s comments. Clinton’s nice words were in turn rewarded with Bengali sweets. In July 2011, Clinton met Tamil Nadu Chief Minister Jayalalitha in Chennai as well. So the confab with Didi is part of a larger trend of meeting powerful Chief Ministers, and exchanging notes on female empowerment in politics as an unstated part of the agenda. We expect this trend to continue, good or bad. Gujarat Chief Minister Narendra Modi may be ascendant in Indian politics, but he is getting the wrong kind of attention from the United States; he cannot visit due to a targeted visa restriction. Nuclear cooperation. Nuclear issues have been toward the top of the agenda for a number of years now. According to Clinton on this trip, India’s 2010 Civil Nuclear Liability Act is a law that would make it impossible for American companies to do business in India. This is a potential $100 billion industry and US firms have had trouble negotiating their way in. Westinghouse is one of the American companies trying to ink a deal with Indian partners in this field. Clinton has been pushing for several years for progress on the legal and regulatory hurdles toward civil nuclear cooperation. India is on board but has the luxury of courting other nations for similar technology and material supplies. Pivot or No Pivot? This is just a matter of semantics, politics, and people’s feelings. Long before talk of an Asia pivot, the United States has had a heavy military presence in Korea and Japan, along with significant naval forces in Pacific waters. That US troops are winding down in the Middle East is a fact, as is the rise of China’s military influence throughout Asia, but these are not necessarily related. As far as trade goes there is no question that the United States desperately needs Asia and vice versa- but in no case is that more apparent than with China. Western media has become fatigued from covering the wars in the Middle East, nearly as much as the armies themselves- and there is a meme at work that the next great game will be between the United States and China. On the face of it this may feel like a change of policy, but we would rather call it a change of media focus projected onto existing policy. Trade data alone proves that the United States and India will engage with each other more and more as time goes on, pivot or no pivot. Terrorism. Though India and United States differ on the threat posed by Iran, they are largely in agreement about their common enemies hiding in the hills and valleys of Afghanistan and Pakistan. Clinton tried to reassure India of its seriousness in dealing with factions such as the Al-Qaeda linked Haqqani network, and the alleged Lashkar-e-Taiba leader Hafiz Saeed. Saeed was a key player in the 2008 Mumbai terror attacks, and has a $10 million U.S. government bounty on his head, a show of solidarity. Sans Makeup! 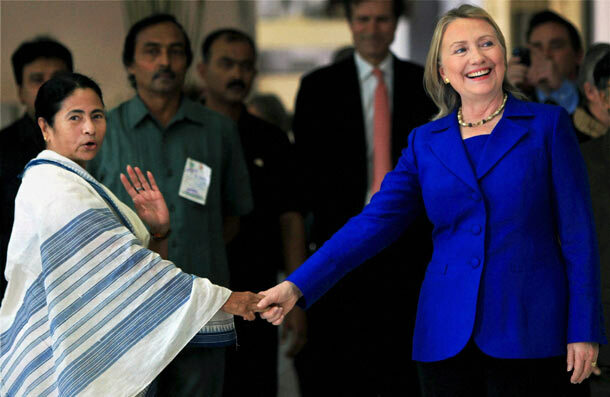 Certain segments of both the American and Indian media had nothing better to do than dwell over Clinton’s simple appearance without makeup at a press conference in Bangladesh. This is one of the benefits of having a female Secretary of State. Most observers agree that US-India relations are at a relatively low point. Clinton’s visit did not change much, but both sides showed the willingness to continue working together and improve things. The strategic dialogue in June should be a more substantive and robust indicator of where each of these issues stand, sans the sans makeup. The flow of trade does not seem likely to subside, which is going to be increasingly important in tough economic times. Mahanth S. Joishy is Editor-in-Chief of United States – India Monitor. Posted on May 12, 2012, in Politics/Diplomacy and tagged Civil Nuclear Liability Act, Didi, Hafiz Saeed, Hillary Clinton, Jayalalitha, Mamata Banerjee, Manmohan Singh. Bookmark the permalink. Leave a comment.